Tata’s foray into the sari business, this lovely store is all about bringing together pretty handloom saris from all over the country. Housed in a beautiful bungalow on the ever changing 100 Feet Road, Indiranagar, Taneira is the flagship store for Tata’s newest brand. Housing over 3,000 one-of-a-kinds saris, you can also check out fabric, lehengas, stoles and dupattas that aren’t run of the mill. In fact, the whole idea of the store is to shine the spot light on one of the oldest professions in the country – weaving. 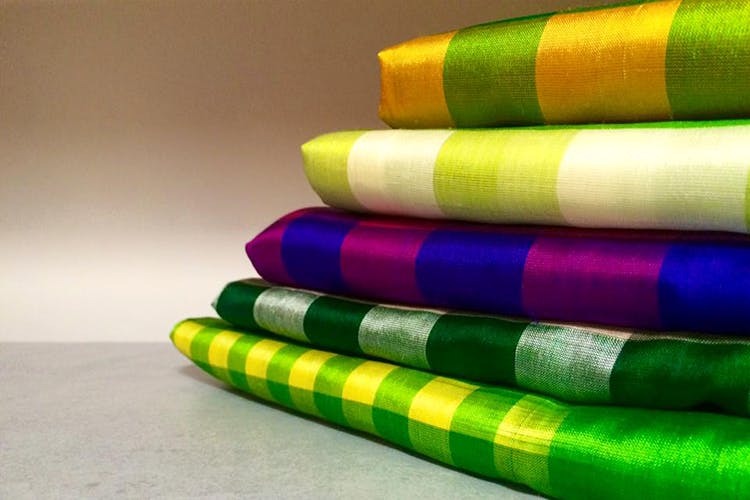 You can find natural, handwoven fabrics and saris that will really make you stand out at the next function. After all, it’s all about culture, heritage and unmatched craftsmanship here. But if you’re looking for ready-to-wear stuff, then they’ve got you covered too. Looking for something specific, feel free to hit up their Style Studio and customise your own perfect outfit. It’s just a really nice place to just browse and admire such beautiful saris. In fact, take a friend or better still, your mother, and have a gala time here. Check out the linen and Jamdani sari collection – it’s exquisite.